English translation of the Hukamnama from Siri Guru Granth Sahib Ji for the "Celebrate the living legacy of Yogi Bhajan" event. Sikhs ask SikhNet : "Who has distorted Sikhi?" 5. Yogi Bhajan taught that you should have a photo of the golden idol of Sri Chand, that is at the entrance to the SikhNet Gurdwara in Espanola, in your home. 14. Yogi Bhajan taught that when he died, only his physical body would be gone. His soul would then reside in his subtle body which would hover over his students, while he still taught and led tantric. To his students he would not be dead but immortal. 15. Yogi Bhajan taught that a miniature kirpan of one inch worn in the hair was enough to satisfy Guru Gobind Singh Ji's 5 kakar's requirement. Isn't it ironic & sad that SikhNet & Yogi Bhajan's 3HO sect refuse to acknowledge Vikram Singh now that he is offering sincere & legitimate criticism of Yogi Bhajan and 3HO's Kundalini yoga. Sikhs request SikhNet stop censoring posts which legitimately criticize Yogi Bhajan & reveal the truth behind the history of 3HO gora Sikhs. Please find my reply which SikhNet blocked, to a recent SikhNet article "Guruka Singh: How I Became A Sikh": When you talk about "....in 1969 first Batch of American Sikhs visited Siri Harmandir Sahib in Amritsar" as being "pooran sikhs", there are some things you don't realize. First of all, for the record, it was 1970-1971, not 1969. Secondly it was all for show. The overwhelming majority of Yogi Bhajan's "pooran sikhs" were wearing turbans only because they had been told by Bhajan Yogi to do so! 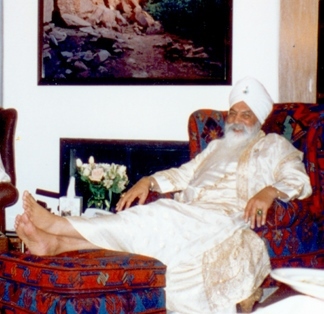 Yogi Bhajan knew that it would hugely impress the innocent Punjabis who desperately wanted to believe that Bhajan was converting white westerners to Sikhism. Bhajan knew it would cause a sensation and it did. By the time the white westerners left India there were only a handful who were still wearing turbans and today only one, that number is ( 1 ) of those people is still a Sikh. I might also mention that that one lone person who remained a Sikh is still part of the Yogi Bhajan sect and actively practices tantric & kundalini yoga which are not part of Sikhi. What's so great about that?